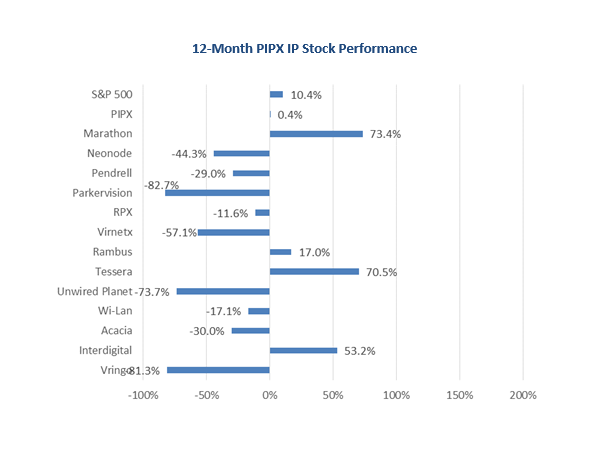 Despite a soft first quarter 2015 for the 13 IP licensing company stocks that comprise the PIPX IP Stock Index, versus the S&P 500, individual winners and losers that bucked the trend. Vringo (VRNG), down 80.9% over the past 12 months, was up 18.2% in the quarter one, the most in the group. Also advancing were Rambus (RMBS) was up 13.4%, Tessera (TSRA) 12.6%, Virnetx (VHC)10.9% and RPX (RPXC) 4.4%. Unwired Planet (UPIP), Acacia (ACTG) and Marathon (MARA) were down, 43.0%, 36.8% and 31.0% respectively for the quarter. For MARA it came after a stellar 2014 where it gained some 170%, so some profit-taking is not unexpected. InterDigital (IDC) also cooled off after a torrid 4Q 2014. 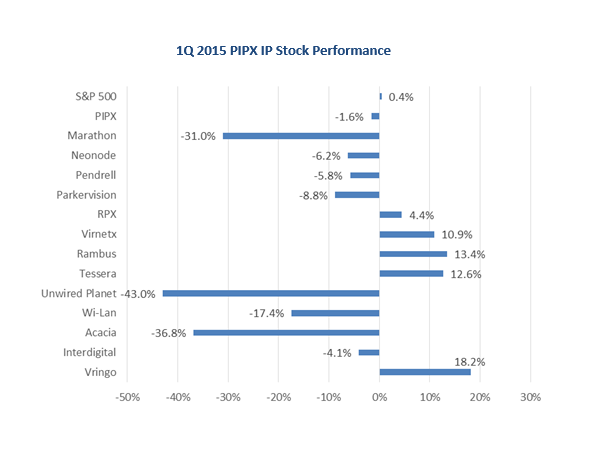 PIPX under-performance relative to the S&P 500 was more muted in the first quarter. 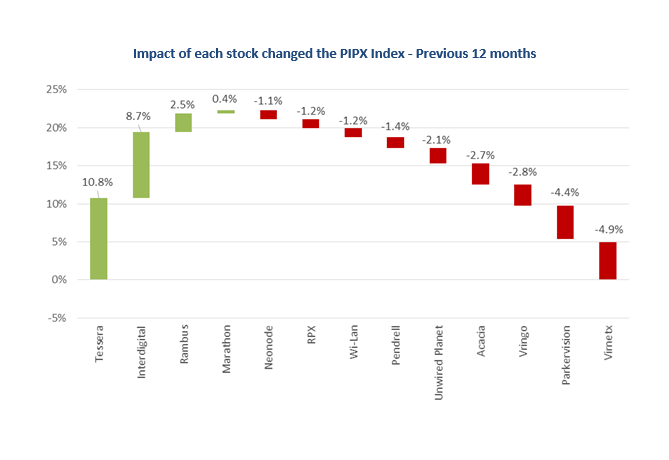 This appeared to be less a result of improving performance among PIPX sector companies as a group, than improved performance among a handful of larger Index leaders (Tessera and InderDigital), whose weighting impacted overall results (see final graph). Vringo’s stock was beaten down significantly in the 2014 as the result of adverse decisions in court, so its gain is less impressive in relative terms. Its improved stock performance is either being considered by some investors as a positive harbinger, or the shares are enjoying a favorable bounce due more to traders than long-term investors. The role of depressed patent values as a result of the American Invents Act, IPRs and proposed proposed additional anti-patent litigation legislation in poor PIPCO performance is difficult to determine. The likelihood is that investors are beginning to regard some companies as better capitalized and and more sufficiently equipped for the long hall, whatever the scenario. Those larger players that appear to be in possession of sufficient numbers of good patents and licensing opportunities, appear to be the best position to perform over time. The PIPX Index, compiled exclusively for IP CloseUp by Dr. Kevin Klein, Director of IP Licensing at Freescale Semiconductor, is designed to provide a measure of the market value and health of the intellectual property licensing business. The index consists of 13 public companies all whose market capitalization exceeds $100M, whose primary focus of licensing and enforcement of patent intellectual property. The companies included in the index are listed in Table 1. Several of the companies’ market capitalization has fallen below $100M since being added to the index. The 2015 1Q PIPX update can be found here.